SHOULD YOU DO A FULL BROADCAST EPOXY FLOOR? The short answer is no unless you’re a professional and have done it many times before. Many customers call us and state they would like to do a full broadcast color flake epoxy floor for their garage or shop. Then after speaking with us for a few minutes they change their minds. It may seem like a good idea when you read about it but doing it is much harder than it sounds. First off you need a tremendous amount of flakes, 70-75lbs of flakes for a typical 2 ½ car garage. Trying to do it with less chips and your floor will come out blotchy! Then you have the problem of applying so many flakes without them piling up in uneven lumps. If you’re not experienced in applying the color flakes they will end up in uneven layers and piles. Other companies trying to sell you on this will tell you that you can scrape the chips down. Again easier said than done and even after scraping and even sanding, the floor won’t look right. So in addition to having your brand new epoxy floor not looking right, you’ll have to spend additional money to purchase a lot more topcoat. When you do a full broadcast, all those chips piled on top of each other create lots of nook and crannies. Those nooks and crannies have to be filled with topcoat, so plan on spending a lot more money on topcoat and time applying it in at least two coats or maybe three. How do we know this? We know this from the thousands of floors we’ve done with our own guys. They have to know what they’re doing and even they screw it up every now and then. Which means they have to grind the floor off and start over. That’s why over 90% of the floors we do are not full broadcast. 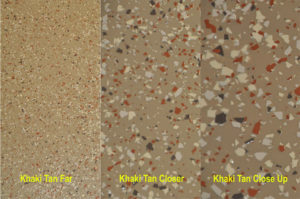 ArmorGarage offers two color flake floor options. 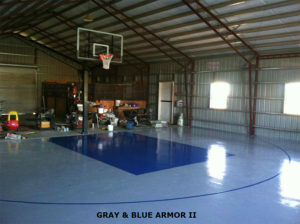 The Armor Chip Garage Epoxy Flooring kit which provides you with about 75% chip coverage. Our Armor Granite kits provide you with 90% coverage. Both of these floors use the base epoxy color as one of the background colors. They both provide a beautiful finish that looks like you had a Pro do it for you even though you did it yourself for a fraction of the price. In fact, most customers don’t use all the color flakes we provide in each kit. We provide you the most color chips of any company so that you can apply the color chips until you like the pattern without having to worry about running out. So why spend extra time and money and run the risk of having your floor not looking the way it should when you can get a gorgeous looking floor every time with our Armor Chip or Armor Granite Epoxy flooring kits. Whenever you are buying anything it helps to know what exactly it is you’re buying. By that we mean not simply knowing you’re buying a certain product such as a car, a steak, or an epoxy floor coating. A question that we get asked a lot is why is your epoxy coatings or garage flooring more expensive than the other coatings and flooring products out there. To answer that the best way we can; lets use the analogy with the items above such as the car and a piece of steak. If you’re car shopping you can ask why is a Mercedes so much more than a Toyota? Well as we all know the Mercedes is a higher quality vehicle with much more expensive components and options. But why is a Mercedes S class so much more than a C class. Well again it’s a higher quality car, it’s bigger, with a bigger engine, more horsepower and has a lot more expensive options. Now lets take a piece of steak as an example. You can buy a nice Ribeye for about 9 bucks a pound and you can buy one for 29 bucks a pound. Why the difference, they’re both steaks? People tend to think that way with their epoxy flooring and garage flooring purchases. Why is one garage tile or epoxy floor paint so much more than the next one, they’re both tiles and paint. Well with the steaks, the $9.00 a pound steak is probably Choice grade, the $29.00 a pound steak is Prime grade, big difference. The more expensive steak may also be Dry Aged and Hormone free. We could go on but I think you get the picture. The point we are trying to make here is that knowing the details about the products you want to purchase will give you a better understanding about the price levels of each product. For instance, before you buy an epoxy floor coating you should know whether it’s water based or not. If you buy an epoxy that’s water based you can be paying for water that comprises up to 50% of the product versus a high quality epoxy that is 100% epoxy. Lets say the 100% solid epoxy is like the Mercedes, now you have a C class epoxy and an S class epoxy. What’s the difference, they’re both 100%? One way to know is does the epoxy come with a true topcoat that has a hardened finish and not just a clear version of the unhardened epoxy? A true Topcoat is a hardened epoxy. To find out, check the abrasion rating, the lower the mg loss rating the better the coating. An abrasion rating over 20 means the Topcoat or epoxy is not hardened and it will not last. Check the impact rating, check the thickness of the coating. Thinner coating will obviously wear out faster than thicker coatings especially if they do not have a hardened finish with an abrasion rating of 20mgs or less. These are critical things to know. Knowing these facts will make sure you are buying an epoxy that will be up to the traffic load on your floor. It will also make it easier for you to make the purchase knowing that you are getting a much higher quality product. The same can be said for garage tiles, some tiles are hollow core and made from recycled soda bottles versus our tiles that our solid high quality PVC. Again, a big difference. A hollow tile weighs less than a pound of the cheapest quality plastic while our tiles weight 4.5 lbs each of high grade PVC. So there is a perfectly good reason for the price differential just as there was for the steaks and the Mercedes. You just need to know there’s a difference and what that difference actually is. So before you buy, check the specification, ask questions and make sure you know what you are buying and that you are satisfied with the level of quality you are purchasing. WHEN IS AN EPOXY BARGAIN NOT A BARGAIN? Everyone likes to get a good deal and save money. But sometimes a good deal is not really a good deal at all. That’s most often the case when dealing with epoxy floor coatings. There are many different types and prices range from $75.00 for a Home Improvement store kit to our kits that are north of $500.00. What is the difference? Well first there’s epoxies made with different types of bases. There’s water based, solvent based and solids based. With solids based epoxies being the best. Then there’s different classes of epoxies such as Aliphatic, cycloaliphatic, polyaspartic and polycuramine. Let’s talk about bases first. Water based epoxies are your lowest quality epoxies since about 50% of the epoxy is water. So that as the epoxy dries the water evaporates out and you’re left with only about 50% of paint material on the floor. In addition to that, water based epoxies have low abrasion resistance, poor adhesion and will wear off your floor very quickly. The same applies to most solvent based epoxies, they’re just not good quality coatings. Solids based epoxies are the most expensive to make and when you apply it to your floor you get whatever percentage of solids in the epoxy onto your floor. For instance, if you apply a 100% solids epoxy, you get 100% of the epoxy onto your floor. If you apply a 90% solids epoxy, you lose 10% of the product to evaporation. Our Garage Floor epoxies are 100% solids. Now let’s talk about the different classes of epoxy. You will hear and read all sorts of things that this epoxy is X times stronger and this epoxy is superior to standard epoxies, etc. Take it from somebody whose made and used every type of epoxy out there, Aliphatic is the best tried and true type of epoxy. A 100% solids Aliphatic epoxy combined with a Urethane epoxy topcoat is the best floor coating you can use on your floor. Cycloaliphatic epoxies, even if they’re 100% solids are no match. They’re not as abrasion resistant, not as thick and are not UV stable! Some of our competition try to pass off their epoxy in a clear version as a topcoat. Don’t be fooled, you are just wasting your time and money. Polycuramine epoxies claim to be 20 times stronger than epoxy but we never see any specifications as to what and where they are stronger. The fact is that these well marketed epoxy kits are only 3.6 Mils thick as opposed to our Armor Chip & Armor Granite epoxy flooring that are on average 20 Mils thick. The polycuramine kits are not UV rated and do not provide the stated coverage. So you have to buy a lot of extra material to finish your floor and then the colors don’t match cause you have different batches. So the bargain you thought you were getting is now costing you almost as much as an ArmorGarage epoxy floor and it’s nowhere as durable and it looks terrible. So now if you want your floor to look right you will end up spending much more money and time than if you just bought an ArmorGarage kit in the first place. Polyaspartic epoxies are good in the right applications, they cure very fast but are thin mil and are difficult to work with. If you need a polyaspartic epoxy we recommend you consult with one of our experts. So in sum, when dealing with water based, cycloaliphatic and polycuramine epoxies they may all seem like a good deal but at the end of the day you will be disappointed. You will have curing issues, color issues, coverage issues and most of all they won’t last anywhere as long as you thought they would. Saving a few dollars should not be your main goal when doing and epoxy floor job. With epoxy coatings you really do get what you pay for! Girvan P. wanted a two color floor with a border. This is how he did it. Once the floor is properly prepped by etch acid etching or grinding and or both. You apply the first base coat. In Girvan’s case he wanted a solid color so we went with our Armor II commercial system. So he did the whole floor in Light Gray and then when that dried the next day he taped off the rectangles and applied the Dark Gray epoxy inside the tape lines. He let that dry and he then taped off the border area and lightly sanded the epoxy floor border area inside the taped area. This was because the base coat had now been curing for more than 24 hours. Anytime an epoxy coating cures for more than 24 hours you want to lightly sand it to give the epoxy coating going over it a rough surface to adhere too. So once the border area was sanded he applied the Yellow epoxy coat. Now he sanded the entire floor with a block & pole sander using 100 grit paper. Got off all the dust and sanding residue and applied a clear topcoat over the entire floor. 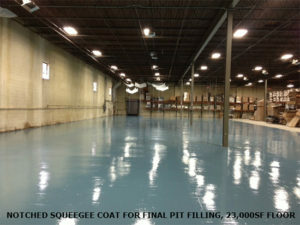 He now has a beautiful two color epoxy floor with high performance commercial coating that will last many years to come. It’s easier than it sounds to do these types of floors and you can use any colors or as many colors as you like. We at ArmorGarage can help you layout your floor and guide you on the best way to do it. Like we did with Girvan. Here’s what Girvan had to say in an email to us. New garage floor successfully installed (see pic)- it looks fabulous! This despite the onset of winter – we managed to keep the heat up sufficiently. Quantities were just right – half a can of clear coat left for touch ups. We get asked all the time when should cracks be repaired both size wise and timing wise as far as etching and coating the floor. Lets start with when you should repair any cracks or divots in your concrete floor. If you’re using our Ready Coat Crack Repair, you would do the repairs after you have cleaned and etched your floor and the floor has dried. You would then simply mix the Part A & Part B together to form a sort of a putty and then you would putty knife it into any cracks or divots. Let it sit a minute or two and then you can apply our epoxy right over it without having to wait for the putty to cure. This saves you a whole day or more waiting for your repair compound to cure. 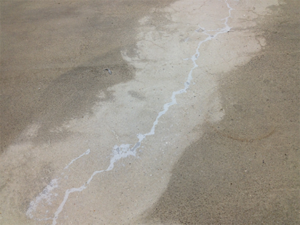 For larger cracks and holes in your concrete slab we have a Crack & Joint compound. This Part A & B get mixed together and then you add in approximately 50lbs of playground sand per gallon of Mortar Liquids and mix together until it becomes a grout consistency. Then you trowel into the repair areas, scrape flat and let cure for at least 24 hrs. If some of your repairs came out a little rough, you can hand grind them smooth. Use this product prior to your etching. When do cracks need to be filled in? Our epoxies are thick and can fill in surface cracks. The trick is to know if the crack is at the surface or if it runs the depth of the slab. Even hairline cracks that run the depth of the slab will consume a lot of epoxy to fill them up. Best to use one of our crack compounds to fill them in. For small cracks you can run a grinder wheel down the crack to V out to make it easier to apply the repair compound into them. For Control Joints and Expansion Joints use the Epoxy Crack & Joint Compound with the sand to fill in. Please note we always recommend not filling them in. Once you fill these in you run the risk of getting a crack down the middle of your brand new high gloss epoxy floor. Especially on newer floors. Although these joints look unsightly now and are garbage collectors, keep in mind that once you’re done epoxying the floor the joints will actually make the floor look better and since the joints are now epoxy painted no dust and dirt will stick inside them. So, unless the control or expansion joints make you physically ill at the sight of them, don’t fill them in, just finish them inside and out with the epoxy. There are quite a few places in which you can start using garage floor epoxy, but there are also quite a few places that you’ve never thought of. The garage is definitely a sure bet, and even a parking a garage will benefit from this placement. There are, however, several rooms that can definitely make use of this epoxy flooring type and today we’re going to talk about battery charging rooms. Before we get into that, however, let’s go over again very briefly the benefits of good quality garage floor type of epoxy and why you should consider it for virtually any hard floor surface. 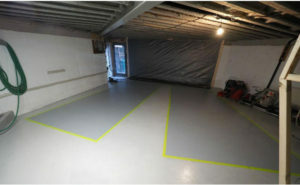 What is Garage Epoxy Flooring? Okay, one of the biggest mistakes that people make when they are selecting something like garage epoxy flooring is believing that it is actually just paint. Yes, you can paint your garage floor but there is a strong chance that it isn’t going to turn out nearly as good as it would with high end epoxy flooring, and with good reason. First of all, it’s highly durable and it definitely stands the test of time. If you really need proof of this, all you need to do is take a look at our website and you will see a few side by side demonstrations, including one from a parking garage in which the coating form a competitor wore down very quickly compared to our epoxy which still looks brand new. It has been proven time and again that the right epoxy can benefit you in ways that you never even realized. Not only does it last for a long time, it looks really good and let’s be honest, that’s really what counts. Now that we’ve covered that, let’s talk a bit about battery charging rooms. Leaks – This is something that is most definitely going to happen in any scenario where battery charging is involved. A leaky battery isn’t on anyone’s list of things to have, most certainly, but it happens more than you would think. Leaks in a battery room can be particularly detrimental to the floor as you can be dealing with far more than water. Many batteries bring with them corrosive substances, and they are definitely not something that you would want on a typical concrete floor. Leaking acid will eat through your concrete floor fairly aggressively! Then it will cost you much more to repair your floor than a good epoxy floor coating would. Drops – Depending on the type of batteries you’re dealing with; they can be pretty heavy. Epoxy flooring can withstand small impacts without taking serious damage, and with that being the case, they are often perfect for battery charging rooms. While epoxy flooring is not invincible by any means, it can certainly be very helpful in these situations. 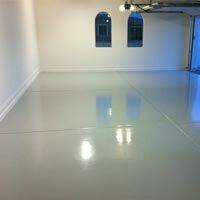 Illumination – Just as with any other work environment, having a nice, well lit room is absolutely essential, and garage epoxy flooring will brighten any room, especially with a high gloss topcoat. It looks great, it feels great, and it saves energy – what more could you possible want? Cleanup – Yes, you will need to clean your floors eventually, even in a room that is only used for charging batteries. The thing to remember here is that epoxy flooring is incredibly easy to clean and maintain. You don’t need to use abrasive chemicals and you don’t need to spend hours on your knees trying to scrub an impossible stain. Epoxy is stain resistant and will go right back to the way it was before you know it – that alone is a great reason to use it. Battery charging rooms can be found in many different types of facilities such as golf clubs, warehouses, factories and even homes that have golf carts. With so many different electronic devices in play today, you can almost be rest assured that you’ll need one. Retail stores often use battery charging rooms for their PDA devices, and colleges often use them for the charging of laptop batteries. There are plenty of other great applications, but when it comes right down to it, you’re going to want to protect the floor from being damaged. It’s a job for an epoxy and you know it can handle the best. You can be rest assured that the garage floor epoxy cost is well worth it when you consider the results. 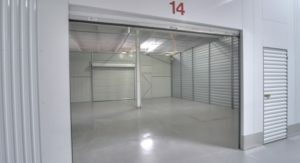 If you are the proud owner of a storage comapny for example keepsafe storage units, you’ll agree that whether it is indoor or outdoor you know one very important fact: storage units see a LOT of action. There seem to be two different types of renters when it comes to storage units. There is the first type, which tends to organize everything and makes sure that everything is placed inside the unit in an orderly fashion. They may even stop to alphabetize everything, you never know. The second type is the kind that every storage unit owner dreads: the type that simply drops everything into the storage unit and shoves it against the wall as hard as they can, hoping that the door actually closes. That’s on top of keeping everything like the units managed and organized and ensure that those renters keep up with their payments. There are, luckily, storage management software to help owners keep up with all of this, if you are an owner of a storage unit and you want to check out a storage management software, you might want to View Site here for more information. These are the types of people that usually end up with the entire content of their unit up for auction at some point, but we digress. No matter which type of renter you have, there are a few things that you can be certain of. The first thing is that scratches happen, especially when furniture or other heavy items are being dragged against the concrete floor. The second, is the inevitable spill. You never know what people are going to be putting inside their storage units and there is a good chance that you never actually ask. You can have a specific set of guidelines, but in the end, you can’t just go through every single box that people pull off the back of their truck. You could have anything from oil spills to soda, and every single thing in between. You probably also know that when they do this, they never stick around to clean it up. Not only is this a hassle for you to clean, you have probably also found that it can cause damage to your units, considering concrete is very easy to stain or crack. One of the best solutions is to use a garage floor epoxy, which is an outstanding way to bring new life to an old floor. As we said in the previous paragraph you’re going to end up experiencing a number of different problems with renters and the first one we are going to address is spills. Let’s take sticky substances for our first example. You never know how long a renter is going to hold onto a storage unit, but if something spills in there, you also never know if they’re going to clean it up. It could literally be sitting on the floor for days, for weeks, or even for years; you never know honestly. All you know is that when they leave, they’re not going to be cleaning it up. Now you have a problem. If it’s a standard concrete floor, you’re going to be on your hands and knees trying to scrub it up, and there is a good chance that it will never actually come up. It will probably even soak into the floor! If you have an epoxy flooring however, a good mopping and perhaps even some pressure washing will take care of the problem – it’s really nothing you need to worry about. Along with being easy to clean, epoxy tends to be much more resistant to absorption simply because garage floor epoxy actually seals the floor, making it completely impervious. 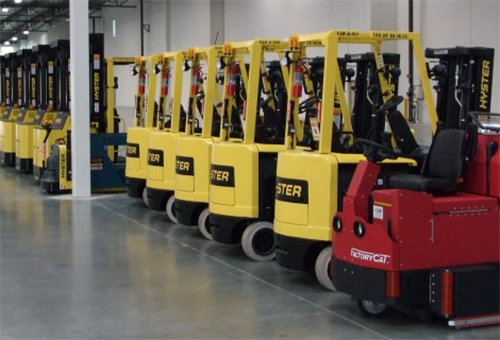 In addition to that you have to protect your floor from the wear and tear from dollies, pallet jacks and hand trucks rolling in and out all day, everyday. ArmorGarage epoxy systems are forklift rated. It’s hard to imagine anything much better than that. Of course, the durability factor will be much better if you use our military grade topcoat, it will protect the epoxy itself and keep your floor looking new for a lot longer. Then once the clear topcoat begins to wear you simply roll on a new clear topcoat and the whole floor comes right back to new without ever having to redo the epoxy paint itself. The products from Armor Garage are resilient, and much more durable than the big box items that you would normally purchase from a store – don’t miss out on making your storage units virtually invincible. Garage epoxy flooring has many different uses, as you have undoubtedly already discovered. From the garage, to the storage unit, and even the workshop; don’t make the mistake of going with a lesser brand, go with the product offered by Armor Garage and get your floor in gear. Classrooms see a lot of action to put it mildly, and there are certain precautions you will want to take in order to ensure that the floor does not get damaged and while there are plenty of things for you to consider in this vein, today we are going to be talking about epoxy coating the floor. Now if you were to look at most school classroom floors from the mid-50’s and through the early 90’s, there is a good chance that you would find them to be covered with vinyl tile. This works up to a point so long as the tile is kept in good condition but let’s be perfectly honest here: it’s a classroom, and when it comes right down to it, you’re not going to be able to keep it in good condition. There are too many things to take into account and far too many uses for garage epoxy flooring. Your classroom is going to need a coat of super durable epoxy paint for a few reasons. First of all, a classroom is an extremely high traffic area. Secondly, a lot of ‘things’ happen, to put it mildly. For example, items are dropped, desks are dragged, and all manner of other things happen. As they say, kids will be kids, and in any pre-college classroom, you’re going to need a floor that can stand up to the abuse. In addition to outright trauma you’re going to find that the floor can become easily stained and scuff marks are very common with children. What you need to do is make sure you are able to clean up the floor and most importantly, that it doesn’t break under pressure. 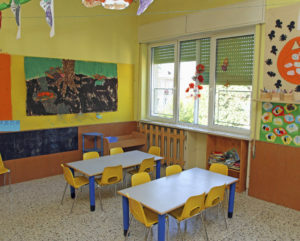 In older schools you’re going to see vinyl flooring tiles that have broken, chipped, or are completely displaced, and that’s not something you want to see in a classroom with children! Epoxy flooring is cost effective and has many benefits that you might not have discovered yet. Let’s take a look at some of the benefits and the reasons for an immediate installation. The first thing that you need to know about vinyl tile is that while the tiles themselves are pretty sturdy and impervious to damage, you’re going to find that the cracks in between them can cause a serious problem. Even spilled water can creep into those cracks and dislodge the tile, ultimately causing it to crack. They also need constant maintenance. Now if you take floor epoxy, it actually seals, completely, so that you won’t have to worry about it cracking, swelling, or taking on an unsightly appearance at any point in time. If you’ve ever seen old vinyl tiles, then you know how valuable it can be to have a solid, sealed floor to enjoy for many years to come. Some VCT tiles can be asbestos which is a real health hazard especially in classrooms. Our Epoxy Coat All System allows you to epoxy paint right over these asbestos tiles, which will completely encapsulate them. If your tiles are not asbestos we recommend that you remove the tiles and then you can use the Coat All System to paint right over the black mastic adhesive!! This will save you a lot of time and money! Epoxy paint can be installed in many different colors and if you want to add a bit of flavor to that installation, why not consider adding some color paint chips to your floor epoxy with a military grade clear top coat to make it last a lot longer? There are endless possibilities with an epoxy floor, and it won’t be too long before you want to use epoxy in every single one of your rooms. You can trust us when we say it’s a big improvement over the other types of flooring that you might choose to utilize. That being said, it’s time to stop relying on unreliable flooring solutions, and time to start looking into the floor epoxy as a cost effective alternative. We might be slightly more expensive than the big box stores, but our product lasts a lot longer and it is definitely more reliable at the end of the day. You can be rest assured that no matter how much money you sink into your epoxy flooring renovation, you’re going to find that cost is returned to you tenfold over the next few years. Take a look at our floor epoxy systems for sale and bring your classroom to the next level. Getting ready to build the perfect man cave can be a bit of a challenge, but in case you’re not familiar with the term, what is a man cave exactly? How should it look? What should the building of it entail? The first thing you need to know is that the man cave is intended to be a completely masculine space. You might outfit it with wood paneled walls, or you might want to consider hanging a moose head up at the front of the room or an indoor basketball area to hang out with friends. Then again maybe you would like to set up a massive television and a bar. Before you build it all the way up, however, let’s start at the lowest point: the floor. When it comes to making sure you choose the right floor for your man cave you definitely have plenty of choices. Some people are going to go with carpet while others will favor hard wood floor. If you are like many men however, you would love a more industrial look, especially if your man cave is separate from the rest of the house. With that being the case, there is a good chance that you have chosen to make use of concrete floors, and that’s an outstanding idea. There’s a good chance you’ll be doing some drinking in here, probably a lot of drinking, and spills are going to be a fact of life. That being said, while concrete is a great choice, you’re going to want to make sure that it is protected. We’re speaking of course about garage flooring, or epoxy – a great way to keep your floor safe from whatever life might throw at it. Concrete is a great start, but epoxy paint is going to make it even better. To start, you can make it any color you wish, and if you want to add a little bit of texture to your floor then you might consider a light chip broadcast. In our opinion, garage flooring epoxy is a great way to give your man cave a sort of ‘garage-like’ feel, even if you haven’t parked a car inside. Epoxy does an outstanding job of sealing up the floor so that you won’t have to worry about spills, and you certainly won’t have to worry about stains. You can easily clean anything that spills on a garage floor epoxy, and you can trust us when we say that in a man cave, there are going to be spills. There are many other benefits of course, the most important of these being that the floor can be designed to be non-slip. It isn’t this way initially, of course, but if you mix an additive with the epoxy mix you can get the non-slip feature and stay far safer in your man cave than you might have otherwise. The garage floor epoxy price from our company might seem a little bit high, but you have to consider the benefits of getting it from a reputable source rather than going straight to the big box store. Our website holds a pretty good example of what happens when you rely on the big box brands – it begins to break down after a year, and that’s probably not what you’ll be happy about. You want something that is going to last for many years, and we can definitely accommodate you. Take a good long look at the products we have to offer when you’re trying to outfit your man cave with the best epoxy floor. It will be well worth it, and consider using the military grade top coat while you are at it. Not only will it be prettier to look at, it will actually last quite a bit longer. With our military grade garage floor epoxy system you can have friends and family over and never have to worry about the floor getting ruined from too much activity on it. Classic cars. Everyone loves them, everyone wants them, and not everyone can have them. It’s too expensive for most people and even those who can afford to have these cars compare car insurance here to see if they can find the cheapest possible policy to help them save money! If you’re lucky enough (or rich enough) to have a collection then you want to show it off. You want to show it off in grand style and you don’t want to skimp on the details. You want all of your cars front and center whether you’re showing off an old Model T from the dawn of the modern car, or a classic 1956 Chevy with its sleek painted exterior. The choices are limitless and they vary from collector to collector. Often, though, collectors turn to sellers, and we see people taking out motor trade insurance so that they can sell their cars to the next batch of collectors. However, we feel that a quality garage with a great collection will deter people from selling off their prize possessions. With your car collection aside for a moment however, you might want to start thinking about how you want to finish your garage floor. Maybe you’ve already set your cars up and have decided that you can do better with the floor, or maybe you’re just starting out and know you need to take your floor to the next level. No matter which it is, you know that garage flooring epoxy is the way to go, and with good reason. 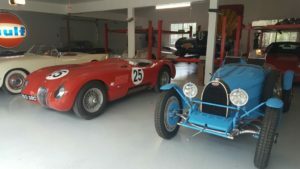 Let’s spend a few minutes talking about just why garage floor epoxy is the way to go and how it can help you show off your classic car collection in best possible way. Your cars shine by themselves but let’s be honest, there’s something cool about having them sitting on a high gloss epoxy floor. It’s shiny, it’s bright, and you can even broadcast chips over it to make a terrazzo or granite look. So you can a solid color floor or a floor with color flakes that can blend with or accent colors in your garage. The choice is yours and you can customize any of our epoxy flooring kits anyway you like. Easy Cleanup – We’re not going to mince words here, if you’re moving classic cars in and out of the area there is a good chance that you’re going to end up with scuff marks, tire marks or oil leaks on the floor. You’ll need to be able to clean them and if you have a naked concrete floor it’s going to be not so easy. With an epoxy floor, on the other hand, you’re going to find that cleaning up anything on the floor is as easy as getting a mop and wiping it up. Liquid Cleanup – You know what the really cool thing about epoxy is? You can spill pretty much anything you want on it and it’s just going to pool at the top rather than soaking into the concrete if its uncoated. This is going to be especially helpful when you find yourself dealing with vehicle fluids – the last thing you want in your showroom is oil stains or corroded concrete. Our epoxies are impervious to all vehicle fluids. Your garage floor epoxy coating is definitely going to make for a better display. The floor will be shiny, and it will be better at reflecting light than a bare or conventionally painted concrete floor. It’s going to add to the aesthetic of your cars, and it’s going to make the room a much more fun place to be – that’s definitely an improvement over the norm. If you’re going to install garage flooring epoxy in your classic car showroom, then we strongly suggest using a topcoat! You could apply just one layer of epoxy on your floor as some of our competitors suggest, but that would be a big mistake, You’re going to find that adding a topcoat can add many, many years of life to the epoxy finish. When the topcoat starts to break down after many years of service, all you need to do is add an additional coat of the topcoat and you’ll be good to go again. The base epoxy should stay unaffected. If that doesn’t sound good, then we don’t know what does. ArmorGarage has many different products available, all of which are able to meet your flooring needs. Choose your color and coat your floor in the best floor epoxy on the market. It’s a quick solution that is undoubtedly going to last for many years!